This pet selfie stick is easily installed to the any mobile phone and it is portable. It takes advantage of a dog&apos;s natural draw and focus and uses this focus to hold their gaze as you snap away that perfect portrait picture. 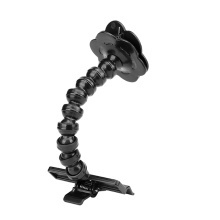 The flexible neck allows you to adjust to any angle, utilizing the front and rear facing camera. Clip on your pet&apos;s favorite treat or toy to grab their full attention. This clip will fit most of smartphone and tablet. The selfie stick can also be used for pet agility training or mobile phone holder. The smartphone accessory that actually ups your pup&apos;s selfie game, so simple and so easy to use.